Datasheet from AT1614 shows 01=RESET !!!! It shows default fuse is 01 - why call it Reset instead of Default Value? Q#1 - which is 01? UPDI or RESET? I am guessing UPDI but will play with it later tonight to find out. Q#2 - if you don't need a physical RESET pin feature, doesn't it make sense to leave it UPDI all the time? What would be the downside? Q#3 - Is there an AVR042 type document recommending a pullup, capacitor, or reverse biased protection diode? If not, are these recommended/necessary/or will prevent programming? Q#3 - Is there an AVR042 type document recommending a pullup, capacitor, or reverse biased protection diode? So far so good. I've got a tiny1614 soldered onto a dip adapter and connected to a 2x3 header. Works great with the ICE, made a small program to blink a LED at 1 Hz. 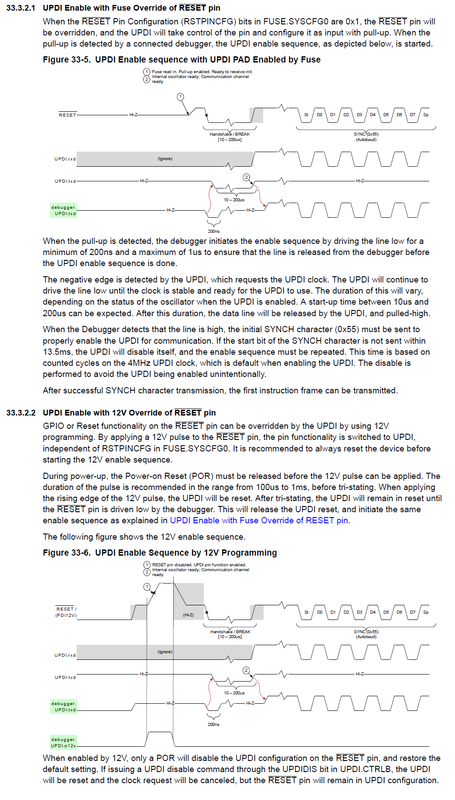 Just now digging into the UPDI datasheet chapter. One question I have so far is: Let's say someone configures the fuse so that it disables UPDI and is in RESET mode for that pin. The question is, is a 12V pulse without any init going to enable the UPDI functionality on that pin? Or does it need to be a 12V pulse plus a proper init cycle? 2nd question - one of the things my programmer does is that if any fuses change, it releases control from the device to let the changes fuses become active before it tries to access the device for programming. Not sure if this functionality will change or not just yet, but if I stay connected with UPDI and just take the device out of reset, will that make the fuses active, or will I have to do more? According to the datasheet, a 12V pulse will override the fuse and set the pin as UPDI until the chip is power cycled. But I never tested this. The question is, is a 12V pulse without any init going to enable the UPDI functionality on that pin? Or does it need to be a 12V pulse plus a proper init cycle? By applying a 12V pulse to the RESET pin, the pin functionality is switched to UPDI, independent of RSTPINCFG in FUSE.SYSCFG0. Caution as megaAVR 0-series is not 12V capable on any pin; its UPDI signal is dedicated to one pin. Ok. Curious me had to test it! I set it to RESET and sure enough it operates as reset and you can not longer access it over UPDI. Then I power cycled it, applied +12V to the reset pin, and this definitely disables the reset functionality because the reset pin will no longer take it into reset. You might think the UPDI is enabled, but trying to access it with the ICE still fails. So it seems to be somewhat enabled and somewhat not. ... but if I stay connected with UPDI and just take the device out of reset, will that make the fuses active, or will I have to do more? The fuses are available from device power-up. Wouldn't you think that if the UPDI is reenabled, the ICE should be able to communicate with it? What is the point of the tri-state? #3 - connect 12V battery + to reset pin briefly. #4 - test reset, it no longer works (does NOT reset the AVR). I would think UPDI is enabled at this point. #5 - connect ICE, it CAN'T read the device signature. Can it be unbricked/UPDI enabled for ICE without a programmer than can do the 12V pulse? Is the AVR doing the second pull down and release in the top graphic? Perhaps the UPDI can be enabled with a 12V pulse, but UPDI really isn't disabled. Isn't the point of the 12V to make it so you can program it? I know the 12V is doing something (it doesn't reset any longer). How long did you apply 12V on that pin? Maybe the 12V pulse needs to be shorter? The 3rd pic in #12 is a double break, it's supposed to reset the UPDI from any state, according to the datasheet. But apparently it's not working, so something is very wrong. Could be, I am just tapping it from a battery with a lead. I have to think it is disabling the reset functionality and enabling the UPDI, but perhaps there is more to the UPDI that must be reset for it to work. The picture at the end of #12 is a zoom out - it shows the very long reset period attempts. It didn't get what it was looking for in that original burst, so it is timing out and retrying. I'll take a screenshot of what a good one looks like a little bit. So are there any 12V UPDI capable programmers yet? I wonder if they will extend the ICE to support it and come up with a new version, or a new product. My theory is that looking at #13, the second time the signal goes low - is that the AVR pulling it low, and then releasing it in HiZ hence the small delay back to Hi (could be from the weak logic analyzer pullup). See the 2nd pic? After a bit under 10us the updi goes from logic low to high impedance, this means it has become enabled, exactly like you see on your "good" chip. In my experiment, I had a 4.7k resistor to ground, that's why the pullup can't pull all the way to VCC, but just a little. So I estimate the pullup to be about 40k. So are there any 12V UPDI capable programmers yet? I wonder if they will extend the ICE to support it and come up with a new version, or a new product. Could be a cost and/or risk reduction to port Atmel-ICE from UC3A4 to UC3C though PICkit 4 would be more likely especially with the forthcoming move to MPLAB X.
Alan you MAY not need 12V at all, maybe for some devices you need it but for the new Mega4809 you don't. EDIT I see, some smaller device use the Reset line for UPDI similar to DW and you may need 12V but I'm not going to burn neurons on this, there seem to be 2 ways of enabling/disabling UPDI even for those smaller chips. Hmmmmm. Could the device pack upgrade have done anything to change this? I updated to the latest pack. #1 - put the good tiny1614 in place (pin=UPDI mode). Sure enough can read the device signature. #2 - thought I'd try something and went to the fuses and let it read the good tiny1614's fuses. #3 - changed to the bad tiny1614 (pin configured for RESET mode). #4 - tried to program fuses (the good ones I read from the good tiny1614). It failed spectacularly with two errors. I tried to read the device sig, it too failed as expected. #5 - I decided to try hitting it with the 12V pulse. I disconnected the Atmel ICE cable. Hit the pin with 12V. It doesn't reset now when grounded. Plugged in the Atmel ICE cable and it reads the signature now! I hit program on the fuses and put the UPDI fuse back in place. Bricked tiny1614 is now recovered! I know I've tried lots of variations of #5 Friday evening with no luck. I did upgrade the device pack - do you think that could have changed something in the way the programming dialog works on this? I'm a bit chicken to try changing it back to RESET or GPIO to see if I can do it again, but I just might to try to get to the bottom of it. Where is the fun in this is you don't destroy a few chips during the exercise? If the 12V blast is necessary then I wonder how does the Atmel ICE do this? Don't know if it has a 12V boost inside just for this. To me there seems 2 ways of doing the same thing?? But no idea really, the only interaction I have had with UPDI has been with the Xplained boards and everything has been provided to me. Ok - a 12V pulse from a battery will sometimes work, but most of the time not. My guess is that doing it manually with a 12V battery somehow doesn't reset UPDI properly though it does enable UPDI/disable reset functionality. I kept unplugging the ICE and hitting the reset pin with the 12V, then replugging the ICE (I'm not sure how well it would tolerate the 12V) and eventually I could read the signature! Once I can do that, then I can go back into fuses and change the fuse BACK to UPDI from reset. Don't know if it has a 12V boost inside just for this. Important: The Atmel-ICE does not support 12V on the UPDI line. In other words, if the UPDI pin has been configured as GPIO or RESET the Atmel-ICE will not be able to enable the UPDI interface.